I have no idea when I moved from the mushroom hating camp to the mushroom loving camp, but I love them fiercely now. There’s something uniquely satisfying about popping a whole stuffed mushroom into your mouth. Maybe it’s the piggish feeling that I like so much. 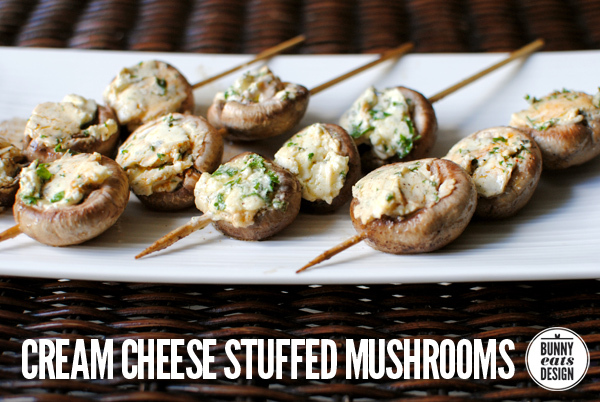 I first tried these stuffed mushrooms when my sister cooked for us a couple of summers ago. My sister Joey can bake and cook. Her version had streaky bacon weaved throughout but I decided to try and make something similar sans-bacon. Not because I’m against bacon, not at all. But even a meat eater can enjoy these tasty vegetarian morsels. Mushroom hating camp may still not be convinced. These stuffed mushrooms are a summer BBQ winner. These can be made a day ahead and they cook quickly on the BBQ so you can pop these on the BBQ just before everything else as a tasty pre-dinner snack. They’re easy to make ideal if you want to employ any idle hands floating around your kitchen. My 30 mushrooms is just a guide and how many mushrooms this mixture fills depends on the size of your mushrooms and how much you fill them. Mushrooms are skewered to allow easy transfer to/from BBQ. But be warned: once cooked, the mushrooms really have a knack of swinging upside down, dropping the melty oozy stuffing out. Don’t hold cooked skewers precariously over beautiful dresses, electronics or nursing newborns. You can also bake these in the oven which avoids skewers entirely. Mushroom tip: Fresh mushrooms are tight and therefore have a smaller cavity to fill. Older mushrooms open up more so you can fit more filling. In a bowl, mix together all ingredients except for the mushrooms until well combined. Rinse or brush mushrooms and wiggle the stems until they break off cleanly, leaving behind a small bowl. Using a butter knife, pack each mushroom with cream cheese filling. Repeat until you run out of either filling or mushrooms. Grill Method: Skewer 3 stuffed mushrooms per pre-soaked bamboo skewer. Pile on a plate or plastic container. Refrigerate until required. To cook, melt butter or add oil to a hot grill. Cook for skewers on one side for 5 minutes until mushrooms are cooked through and stuffing is soft and oozy. Carefully transfer to a serving plate and dig in. Napkins or forks recommended. Bake Method: Place stuffed mushrooms on a lightly oiled oven tray. Bake for 20 minutes at 180°C or 350°F. Serve in tray or stack into to a serving bowl. P.S. Any leftover filling makes a wonderful sandwich or bagel spread. Variations: Swap the Parmigiano-Reggiano for smoked salmon or chopped bacon. Drizzle pesto on top prior to serving. The Hungarians do something similar but deep fried! Love the idea of cooking them on a grill. I’m still in camp hate. Thought I was the only person in the whole world that didn’t like them, but I see now that there is hope that I may switch camps…. Not looking good, though!!! You are the 3rd grownup I know that doesn’t like them. One of the others is a vegetarian. It’s pretty hard going when a vegetarian hates mushrooms. Many restaurants use a mushroom dish as their one and only vegetarian dish. I absolutely LOVE mushrooms. I haven’t made stuffed mushrooms in a long time. Too long in fact. I think I might have to change that in the next week or two. I always used to be in camp hate but I’m converted now. We do something very similar for our BBQ – portobello mushrooms with blue cheese crumbled on top, cooked until all melty and delicious! I imagine blue cheese on top would be perfect if you loved blue cheese! Those are beautiful and decadent. I switched camps too. Mushroom camps that is. I used to smell them and think, ‘yuck, why would anyone eat fungi’? I love them now and I really want to try these! Such simple ingredients – yet they sound so scrumptious! We all love mushrooms at The Orange Bee. I’ll be keeping this recipe in mind for when I have mushrooms next! Please do and let me know how you get on and if you make any alterations to the recipe. These look delicious, and what a unique idea to cook them on the grill. Knowing myself though, they would all flip over as I cooked them causing dramatic fire flares, as hungry guests looked on. I think my grill pan could tackle this job. Pinning! The mushrooms will threaten to tip if you hold them by the skewer so it’s a good idea to move them using tongs rather than gingerly, with your fingers. The are quite rich though and you might find most are happy with one or two rather than a whole stick. Mine are similar – I add blue cheese AND bacon to mine. And we fight over ’em. I don’t have a grill or grill pan – can I do these in the oven somehow? On broil or would that do too much to the filling and not enough to the mushrooms? Any ideas? I would love to make these. Hi Phyllis, baking these for 20 minutes in a hot oven should do the trick. 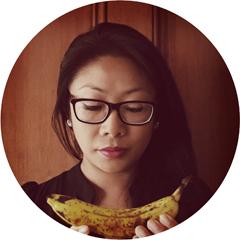 PS good to find another Kiwi blogger too! Thanks for dropping by Carole. Yes, it’s very rich. You grab a skewer and then realise that one is more than enough. I haven’t made stuffed mushrooms in awhile, but you have given me an urge to do that very soon…they look delicious. Yuuum! I love how easy it is. My dad loves mushrooms (he eats mushroom omelette almost every breakfast) I’ll try this out for him. There’s no much room hater in our household.